Back in July, I was prescribed Epiduo by my dermatologist and was supposed to put it on my face twice a day. However, I didn't start using it until the first week in August. The first month, my face broke out so badly. It was probably the worst breakout I have ever experienced in my life. I mean it was really bad. My face breaks out sort of badly when its that time of the month, but during the first month of using Epiduo, it made me break out so badly and when it was that time of the month, my face looked so bad that I refused to leave the house. Another thing that I noticed during the first month was that the Epiduo made my face so dry that it actually made me have some really red and raw patches on my face. 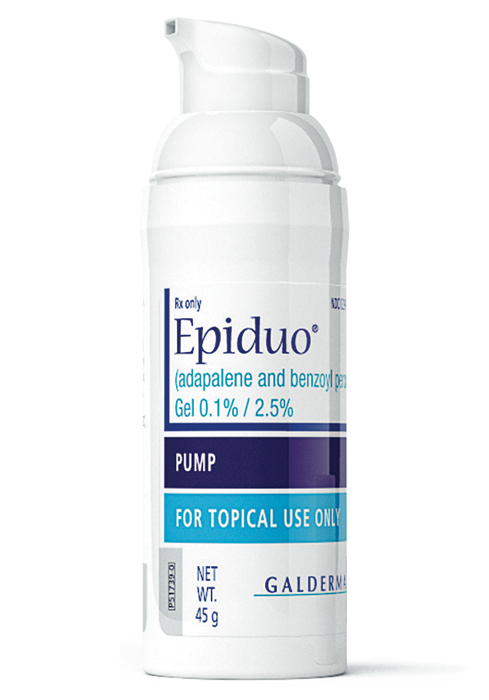 The Epiduo made me have dry patches on my face in places like the sides of my nose, the area above my upper lip, my chin, pretty much the area surrounding my entire lip. Just to make things clear, I DO NOT put this stuff on my lips. The only areas that do not get dry patches are my cheeks, eyelids, and forehead. However, there maybe a small spot or two on my cheeks that may get really dry, but never to the point where it gets red and raw. During the second month of using Epiduo, my face started to clear up in terms of pimples, but the dryness was still occurring. The red, raw spots that were there on my face during the first month where gone, but a week or two after they had cleared up, new dry, red, and raw spots would occur, but in a different place on my face. Usually when I get these raw spots, instead of using the Epiduo twice a day, I would use it once a day, while also using either cetaphil moisturizer, vaseline or neosporin. I also do the same procedure for the raw spots on my face during the first month. Anyways, after the raw spots started to clear up, I would go back to using the Epiduo twice a day, but I stopped using the cetaphil moisturizer as I would put that on after waiting at least 15 to 60 minutes after putting on the Epiduo as that was making my face feel really greasy and all. Now, I'm on my third month of using the Epiduo and I'm getting those dry, red, aw patches/spots on my face, in particular, they are on the sides of my nose, the area above my upper lip, and one spot on my chin and maybe those two spots on my the jawline on both the left and right sides of my face, but those two spots are more like dry patches and probably won't get to the point of being red and raw. From what I read online, it takes anywhere between 2-5 months or maybe even more for a person's face to finally clear up. Another thing I also noticed was that people have said that what the Epiduo does is "purge" your skin of all of the bad stuff, meaning it pushes all of the bad stuff to the surface, therefore, making your acne worse. I have had about 3 of these "purging" phases and I'm currently on the third "purging" phase. The Epiduo has cleared my face up besides the few lingering pimples as it was that time of the month 1-3 days ago, so that's probably why there are a few pimples on my face. From what I also read, is that one of the side effects of the Epiduo is dryness, redness, skin irritation, contact dermatitis, stinging and burning, erythema, etc. I have pretty much experienced most, if not all of these side effects except for maybe the erythema. I know people are different and will have different experiences, so I was wondering if any of you have tried Epiduo and what are your experiences with it. When did the dry, red, raw patches stop occurring, that is if you had any? When did your face finally clear up? What did you do/use to deal with the dry, red, raw patches/spots on your face? There are days where I'm comfortable with how my face looks and I don't where makeup, but there are days like today where I will rarely leave my room because of how bad my face looks. Even makeup won't cover it up as it will make the dry, peeling, red, raw, and cracked patches/spots even worse or won't even cover them up. Like today, I ended up in tears and crying because of how bad my face looked. It has effected my self-esteem and self-confidence and has made me even more depressed then what I'm already am. I'm sorry to hear your experiences of acne and the drying out of your skin with the epiduo. I don't have acne, or use epiduo, so not sure how much I can help. Are you prone to dry skin, or has it only been since you have been using epiduo? It's also interesting that you get dry skin around your nose and mouth, even though the epiduo isn't being applied to these areas. Wondering if you have ever had eczema before? There are types of eczema, and other skin conditions, that occur around the mouth. It could also be a reaction to the epiduo...it sounds like strong stuff, and understandable that certain parts of your face could dry out while you use it. I struggle with dry skin around my face and nose. Not entirely sure how it started but it was worse after using a steroid/anti-bacterial/anti-fungal cream for a long time. My entire face seemed to get drier, even though I was only using it around my mouth. As for the dryness, it's likely you'll need to find a moisturiser that works for you. Perhaps something with a thin, rather than thick consistency, so your skin is less likely to get clogged up. I'm not sure if it'll help, but what's working for me with dryness, is Hydromol (it's like a thick ointment, that you can use water with it to get the consistency you want). It does look a little greasy though. I'm really sorry to hear you are having a hard time. I would advise against make up, at least on the dry bits, just in case it makes things worse. I do understand how your acne and dry skin can affect your confidence. It's really not nice, I know from when I've had dry skin and impetigo for months on end over the last 2 years. Just remember that many people have acne, and so no-one should judge you for that. If things don't get better, you can always check in with your doctor or dermatologist and see what they suggest. My skin is really all over the place. Overall, my skin is really oily, but at certain times of the year, for example the winter time, it will get dry, however, my skin is like 75%-90% oily and 10%-25% dry. You really can't tell that my face is dry because of how oily my skin is. It's almost like the oiliness counteracts the dryness. I don't think I have had eczema before or maybe I have and never realized it. It could also be a skin condition caused by the epiduo or something like that. I'm thinking it's more likely the epiduo as my skin was perfectly fine (and by perfectly fine, I mean there was no dry, peeling, red, raw skin) before I started the epiduo. I think since I have started using epiduo, my face has gotten a lot dryer and my skin would be peeling (almost like those times in the past where I had gotten bad sunburns that would cause my skin to peeling within a few days) and would also get cracked and when I would use a facial scrub (I have used one in a few days because of how my skin is acting right now) it would get rid of all of the dryness and peeling skin, but what's left is red and raw skin. At night (I started doing this, I think, on Thursday or Friday night), I would put on the epiduo, but try to avoid the bad spots (the dry, red, raw spots) like I normally do and wait a couple of minutes. After a couple of minutes have past, I would put neosporin on the bad spots. I would wait a few minutes, then I would apply vaseline. Again, I waited a couple of minutes and then I would apply the cetaphil moisturizer all over my face (the neosporin and vaseline did get spread around, but I would reapply the neosporin and vaseline on those bad spots and reapply the cetaphil moisturizer onto those bad spots). By doing this, it seems to be helping, but the peeling and dry skin on that one spot on the right side of my chin and the peeling and dry skin on the area above my upper lip and the area on the sides of my nose and a tiny bit around my lip area, but there really isn't any of the red or raw skin except for when I scrub my face, but it's not as bad as it was Thursday or Friday night. Another thin I did during the first and second month of using the epiduo was that instead of using the neosporin and vaseline, I would put the epiduo on first while also avoiding the bad spots and then put the cetaphil moisturizer on. Thanks for the suggestion about the hydromol stuff. I have never heard of the stuff before nor have I seen it in stores, so I don't know if it's available in the United States or if the hydromol stuff is available only in the UK. I noticed it's on Amazon, but looking at the prices, it is on the expensive side, but I'm willing to try the stuff, regardless of the price as I'm willing to invest in something if it seems to help people with dry skin and all. Besides the hydromol stuff, do you have any other suggestions that may help? In that case then, it's likely the epiduo causing the dryness. I do understand using a facial scrub, and how, though it gets rid of the dry skin, it leaves the skin red and raw. This is something I'm currently dealing with, so can't offer too much advice there because I'm still trying to figure out if this is helping or hindering. But I do think it's good that you try to avoid getting the epiduo on the red spots, and that you wait a few minutes in between putting the Neosporin on. That said, I'm wondering if it might help a bit waiting a bit longer before putting the cetaphil on? Other than that, it sounds like the routine you have is helpful...though perhaps cut down on the scrubbing if it's aggravating your face. Sorry that Hydromol is expensive! It's likely that it's imported, which probably boosts the cost a lot. Other than that, I've used cetraben and diprobase, which I've had from the doctors and they seemed good too...looks a little cheaper than hydromol on amazon.com anyway.